La Sagrada Familia is Antoni Gaudi‘s biggest masterpiece. This incredible basilica was started in 1882 and is still being built to this day. Yes, that means it has been under construction for over a century! The famous architect knew he wouldn’t live to finish the project, once famously saying ‘My client is not in a hurry’, meaning God. So no matter how many days of trip you’re planning for Barcelona, put it on your must-see list! 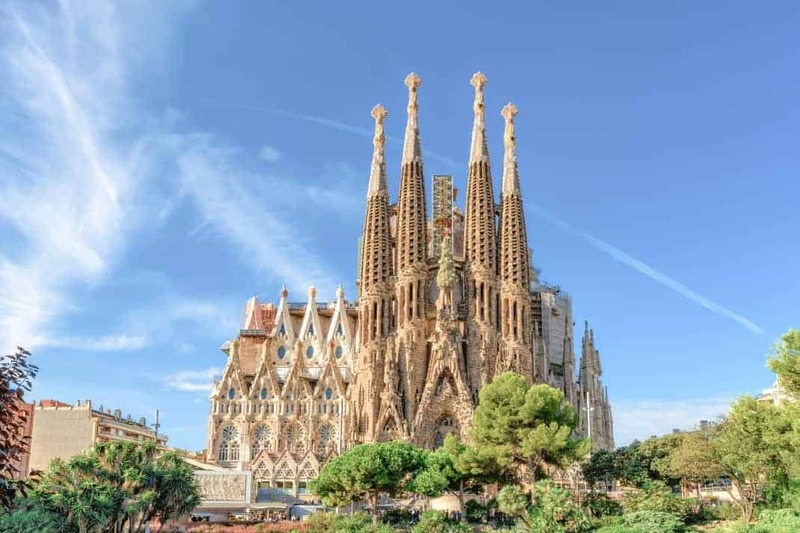 Despite an estimated completion date of 2026-2028, La Sagrada Familia is still open to visitors. In fact, it’s the most visited attraction in Barcelona. Each year over 3 million people are welcomed into La Sagrada Familia. Just one look at the beautiful, unique architecture will show you why. This is a place like no other. Gaudi’s genius will take your breath away from both the outside and in. While you can wander around and enjoy the facade from the outside for free, it’s the spectacular interiors that will really get your jaw dropping. It’s worth every penny to get a look inside. As with most of Gaudi’s work, you’ll find that La Sagrada Familia is filled with symbolism. For example, the interior pillars have been designed to resemble trees, whose shapes constantly change when you look up. The tortoise and turtle that hold up these pillars represent the earth and the sea. You can get more wonderful insights into the design and history of the basilica in the museum underneath, which was once Gaudi’s workshop. La Sagrada Familia is open all year, but closed for some services and special religious events. Be sure to check on the website prior to visiting to ensure it’s open. You’ll also need to purchase a ticket with an allocated visiting time slot. We highly recommend you buy this ahead of time to guarantee entrance and avoid queues. If you wish to visit La Sagrada Familia from the outside only, it will take about 15-30 minutes to walk around. This is free and you won’t need a ticket. If you wish to visit inside – and you definitely should – plan on 1-2 hours, depending on which ticket you buy. Reserve a little more time if you want to see the museum under the basilica, or go to the top of the towers. 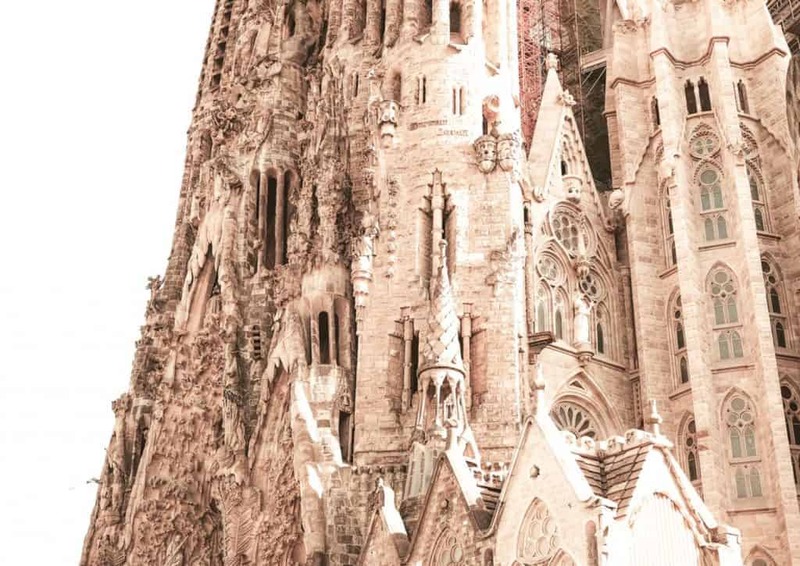 You’ll do a lot of walking at La Sagrada Familia so you should wear something comfortable and light. As Barcelona gets very hot in the summer months, you should remember to take a hat and sunscreen along. The basilica itself is rather cool compared to outside, so pack an extra layer just in case. Circle the outside of La Sagrada Familia to get a full view of the enormous basilica’s exterior. Amongst the ongoing construction, you’ll see the 12 towers that have been built so far from the 18 in the final design. 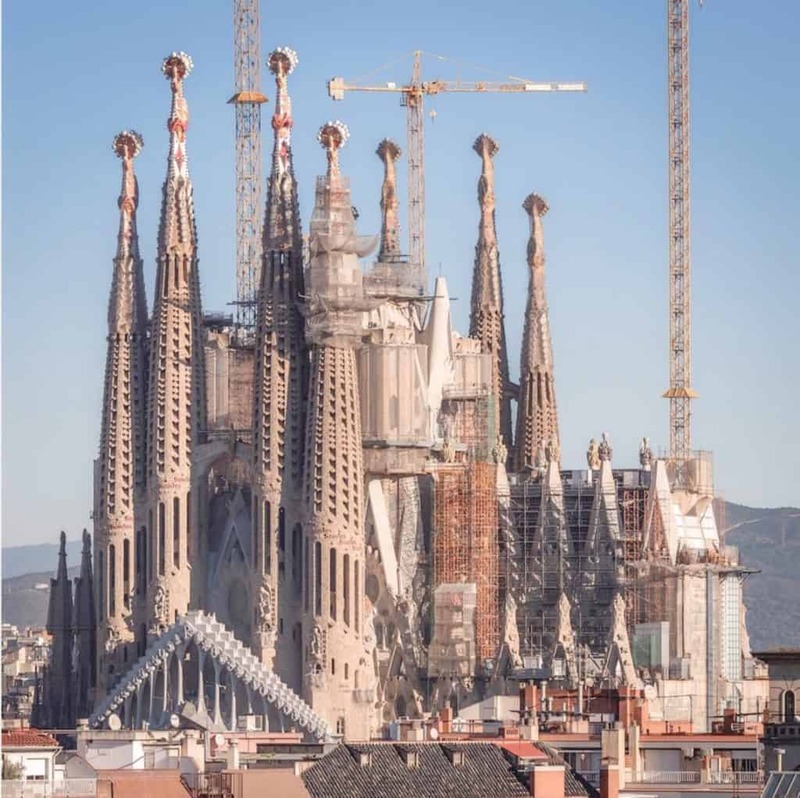 Facing the east you’ll spot the Nativity Façade, which is the only facade to be built almost to completion while Gaudí was still alive. Marvel at the Passion Facade which was completed in 1976, and discover the Façade of Glory which is still under construction, as work only began on this section in 2002. The towers of La Sagrada Familia are just as impressive inside as they are from the outside. When you reach the top of fourth section of the tower, you can easily switch from one tower to another via connecting bridge. Those afraid of heights should avoid looking down here! Inside you’ll find several galleries, one above the other. You also get wonderful views over Barcelona. Towers are accessible via lift for going up, and stairs for going back down, but you’ll have to purchase the correct ticket to get access. You can choose between the Passion Towers with ocean views, and the Nativity Towers, with mountain range views. Under the basilica itself you’ll find what was once Gaudi’s workshop. Often overlooked by tourists, this museum tends to be a small, cool retreat away from the crowds. If you have time then it’s definitely worth seeing. 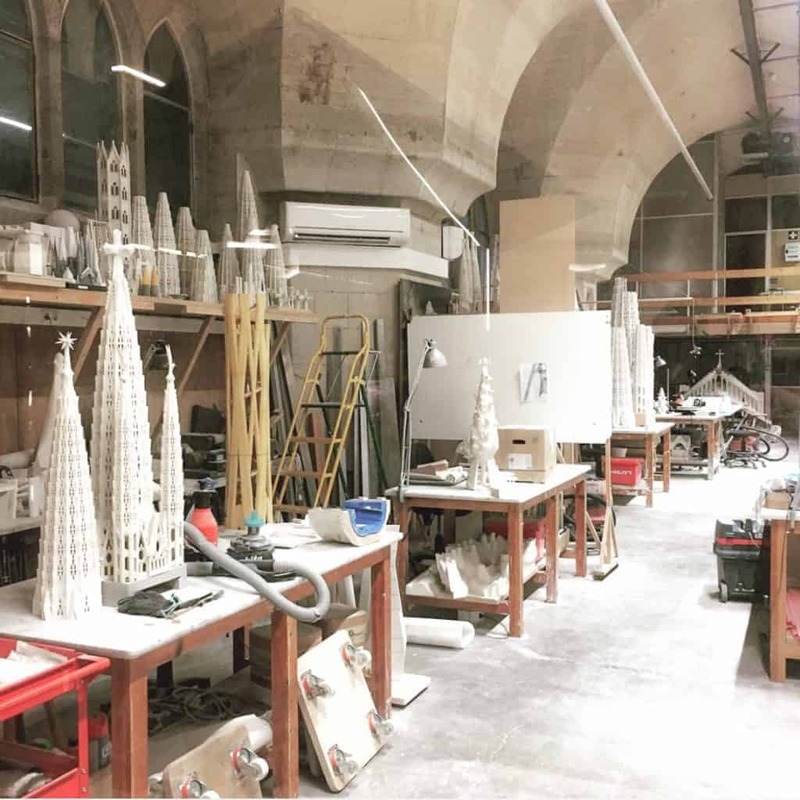 You’ll discover how Gaudi planned the building works, see the restored original models of the basilica and better understand how it all came to be.